CHARLOTTE AMALIE — It was a double whammy. First Irma — then Maria just 13 days apart. And nearly a month after the first of two deadly hurricanes hit the Virgin Islands — the recovery is still in its infancy. Power lines droop over the main roads in Charlotte Amalie, the territory’s capital. At least half of the roofing at St. Thomas’s only airport no longer exists, replaced with sky blue tarps that ripple in the breeze. Most of the territory’s schools remain closed; some on St. Thomas opened this week. About 90 percent of the territory is without power and the vast majority of the population are still without potable water. All because Hurricane Maria devastated St. Thomas and St. John on Sept. 6 and Hurricane Maria demolished St. Croix over Sept. 19-20. While the plight of neighboring Puerto Rico has squeezed the territory out of U.S. headlines, hit hard by Maria over two weeks ago, it has prompted an outcry in the face of a slow federal recovery effort, the continuing crisis here, home to 100,000 U.S. citizens — continues to get little or no attention nationally. 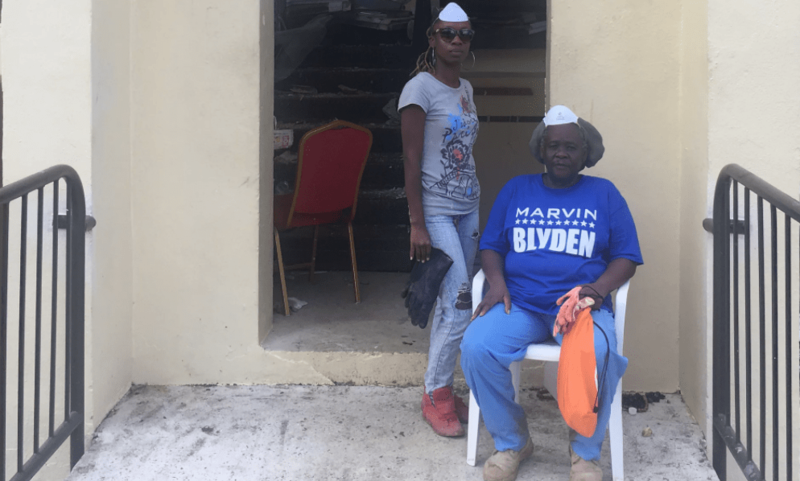 At around the same time the politicians were speaking, 32-year-old Tamika Francis was sifting through detritus at the Tutu Hi-Rise public housing buildings just outside of Charlotte Amalie, where she lives. Entire facades were blown out – front to back – by Irma. A 38-year-old woman was killed after falling from the building during the winds, one of five fatalities in the territories. When Maria hit, two weeks later, it dumped heavy rainfall on to the partially skeletal building, flooding it once again. What is left looks like a bombsite. The remnants of residents’ lives – refrigerators, mattresses, pots, pans, toilet seats, books – are strewn in piles on the hilltop. Although about 160 of Tutu’s worst-affected families have been relocated to shelters and given vouchers to find new housing; others, less affected, had to remain behind. There is no water or electricity. Francis carries pails collected from the cistern up a steep hill and flights of stairs to supply her apartment. Velma Samuel, 62, is a retired teacher’s aide and another resident who remained in her apartment. She said she had seen no representatives from the Federal Emergency Management Agency (FEMA), the government agency responsible for disaster management, present at the building since Irma hit on 6 September. She experienced about a foot of flooding in her apartment during Irma and Maria. It floods again whenever it rains. Mould now creeps up the walls. “As fast as you could clean the mould out, you would find it somewhere else,” she said. Even though the governor has vowed to relocate all of Tutu’s residents, Samuel worried she would have to continue paying her rent, which is financed by her social security payments, on the water damaged apartment while she remained there. In Puerto Rico, the governor passed a blanket moratorium on public rent payment until January 2018. A spokeswoman for the Virgin Islands territorial emergency management agency [Vitema] said no such arrangement was in place here. Irma drove through more than the sheetrock walls of Tutu Hi-Rise. It destroyed two floors of t Thomas’s only hospital. The Roy Lester Schneider hospital can now hold only 23 inpatients. Before Irma destroyed the main medical wards and peeled off the roof membranes, it held 169 beds. Remarkably, none of the patients were injured. But the hospital has evacuated 300 people to the U.S. mainland. It can no longer conduct significant surgeries, its cancer ward – the only one in the territory – was entirely destroyed, and the majority of dialysis patients are now evacuated too. When Maria arrived a week later, with the roof already damaged, the hospital was flooded once again. 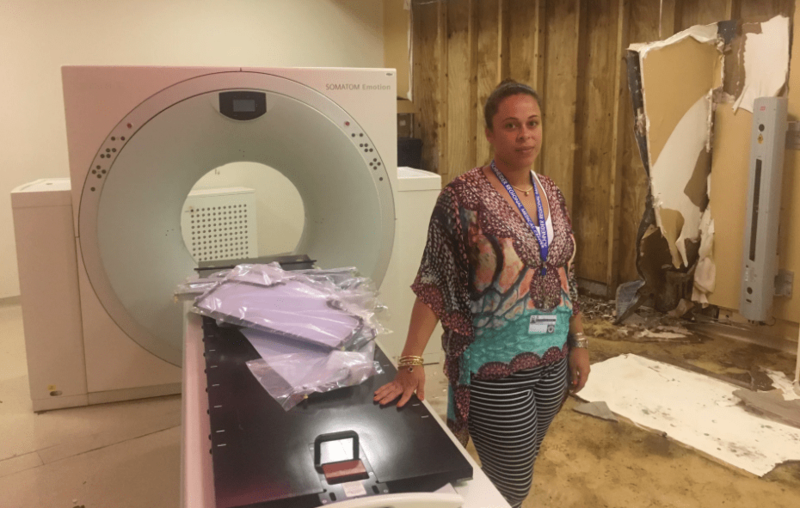 The water has not fully receded and a few inches cover the floor of the cancer center, where Irma’s winds destroyed the facility’s only MRI scanner. Commissiong Dickson said the hospital had received significant federal assistance, but added that it would take an estimated two years to repair the damage. Fema has begun to roll out inspection teams. But, said agency spokeswoman Renee Baffles, it had been “very difficult” to reach all the island’s remote communities, many of which have no formal addresses. More than 14,600 islanders have so far registered for assistance with Fema, but there are undoubtedly many thousands more in need of aid. With no access to the internet and no working radio or TV, Velma Samuel and Tamika Francis had no idea how to contact FEMA and apply for assistance. Although the pair had given up hope for their government, they had not given up on the island itself. She turned back towards the rubble and continued clearing it, piece by piece.